I started a series of swaddle posts because when people say “slept like a baby”, I really thought something was wrong with them, because have they met my baby?? Miko doesn’t sleep much. She doesn’t always nap and she was up often feeding or just playing. She’s four months and it took us awhile to find swaddles she loves, and she's so particular. Now that she’s in the beginnings of teething, she’s even more uncomfortable and I’m doing what I can to help the girl out. I’m hoping these posts will help a fussy baby sleep! Every baby is different but little did I know every swaddle is different too! Modeling in her Poppy and Co. Bow, and her Out of Print Onesie. Miko has always been a wild and independent baby since day one. When she came out of the womb, one of the surgeons was so upset by her screaming, she told me it was the angriest baby she’s ever seen in her career. When they first handed her to me, bundled and swaddled, her stare was intense. She was angry I woke her up and took her out of her warm wet sheltered home and brought her into a sterile cold bright place. A mother knows and I knew. So, we did what we would do to any newborn- we swaddled her and hoped for a pleasant baby. We noticed a pattern right away- she hated the swaddle. Her arms would flail and the familiar arm hitting certain organs made sense from the last weeks she was in utero. We kept trying, but she sometimes wakes up at night angry, and trying to flail her arms again. We remove the swaddle and she’s fine, she’s happy. Well, most of the time. We've use the Ergobaby Sleep Swaddle since week one, it was the first Ergobaby product I ever tried. It’s been our saving grace for extra sleep at night. I have tried traditional muslin swaddles but this girl needs the extra structure. She will kick and scream her way out of every swaddle and remind us about it all night. This one however, has been the one we keep going back to. 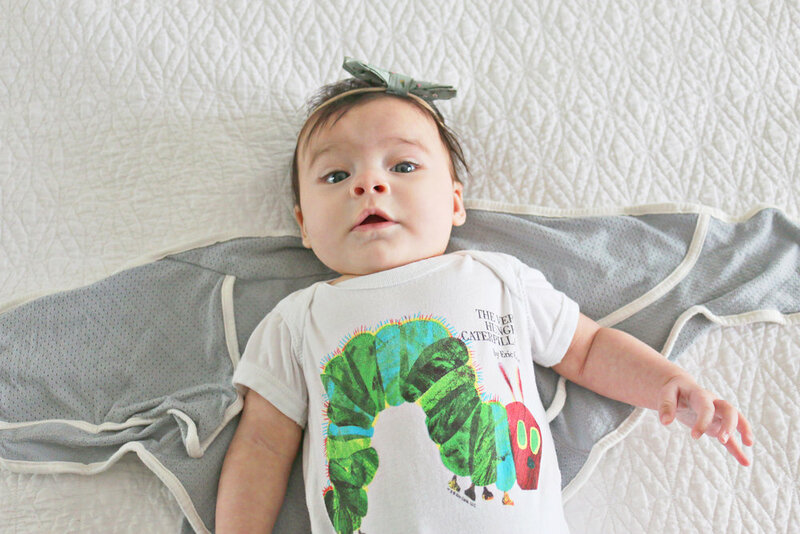 + This is a must for nap fighters and reluctant swaddled babies. I also like The Sleeping Bag Swaddle from Ergo, but this is one piece, which makes it easier for laundry. She tries to get out but is knocked out within a few minutes. + It's breathable. Infants can't control their temperature yet and I'm always worried she's too hot and there's been SIDS report leading to hot babies. This makes me worry less! + I can still change her diaper in it. + I never had a chance to try out their previous swaddle, but this claims to be 33% lighter. + The velcro isn't cheap. This is one thing I noticed about Ergobaby- they don't hold back on quality and that also includes every seam and even velcro! + It comes in neutral colors. It sounds like a silly thing to like but I loved it so much, I couldn't help but wonder if it can be used for the next baby if there is one. + Bells and whistles aside, it works. She's knocked out so quick. + It looks confusing at first. Whatever you do, don't use it on a screaming sleepy newborn for the first time, ha! Once you get the hang of it, which took a couple times to not keep glancing at the instructions, it was so easy. I even ended up swaddling her towels similar to how it folds this after bath time, like picking up a new habit. I know new moms want the best for their babies and they don't want to spend a lot but this is worth a try to help your babe sleep. I love beautiful swaddles but unfortunately, Miko doesn't. This has been a huge help for us in her sleeping. Get the Infant Swaddle here. This post is in collaboration with Ergobaby. This swaddle post has been long overdue, it's tough to take photos at night indoors without waking Miko but I caught her at a good time! All honest opinions are my own and there's no monetary influence. Just keepin' real! Other products mentioned are not associated with this blog, I just really love them. Thanks for the support in reading!